The above info came from Who Wants to Know?, and was edited by yours truly (contact me). The image came from manglobe. In the tradition of Cowboy Bebop , which took science fiction in unexpcted directions, director Shinichiro Watanabe presents a new blending of old and new: a tale of samurai in a uniquely modernized rendition of old Japan. It is the story of three very different people brought together for a strange but common goal. 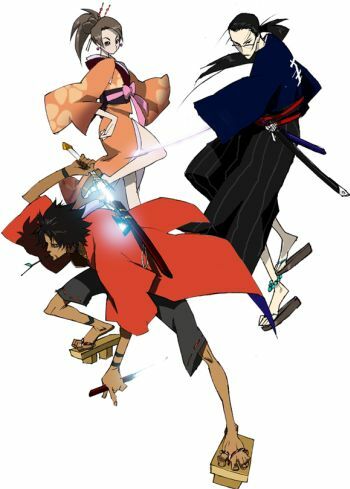 One is Mugen, a fierce warrior who has a primal attitude to fighting and life. He calls his unique style of fighting Champloo Kendo, and it's inspired by breakdancing (sort of like bboying). Another is Jin, a more traditional swordsman who relies on his incredible skill to fend himself against any threat to him, ordinary or not. The two of them are fierce rivals whose path appear destined to frequently cross. They would not even be traveling together if not for the third person in their party: Fuu, a supposedly ditzy waitress who, in excahnge for helping them out of a jam, has asked the two samurai to accompany her on a journey. Their goal--to locate a certain mysterious samurai who smells of sunflowers. And so the three travelers begin their journey through this "new-old" land. As mentioned before, this is far from the typical samurai anime. Mixed in simultaneously with robes and swords (ie. Jin) is very modern and mature ideas along with modern music and moves (ie. Mugen).